The national audience for Monday night’s first of three scheduled Hillary Clinton-Donald Trump debates didn’t come close to projections of 100 million viewers. And it fell well short of the 115.2 million viewers for the 2015 Super Bowl XLIX, which still ranks as the most-watched television program ever. But the debate became first in its class among all general election presidential face-offs, with its 84,011,000 viewers surpassing the previous record of 80.6 million for the lone 1980 encounter between Ronald Reagan and Jimmy Carter. 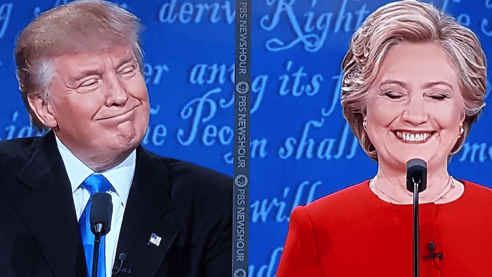 Trump-Clinton also easily surpassed 2012’s first debate between President Obama and Republican challenger Mitt Romney, which had 67,187,000 viewers according to Nielsen Media Research. The 84 million figure for Clinton-Trump was drawn from 13 networks and does not include online watching or viewing in bars, restaurants, dormitories, etc. Seven Super Bowls have drawn more than 100 million viewers to date, with just over half of them (26) pulling in more viewers than Trump-Clinton. The finales of M*A*S*H and Cheers also drew more total viewers. Precise total viewer measurements for the Nov. 21, 1980 “Who Shot J.R.?” episode of Dallas and the Jan. 30, 1977 finale of Roots are harder to come by. Back then, Nielsen used “household” numbers to gauge a program’s popularity. Most sources now say that based on current-day audience measurements, both programs drew in excess of 80 million viewers. There was far less competition then, but also an appreciably smaller viewer pool. Monday’s debate crushed the most-watched Oscar ceremony ever. The 1998 telecast, during which the immensely popular Titanic won for best picture, had 55,249,000 viewers. ***Jane Pauley has been named to succeed the retiring Charles Osgood as host of CBS Sunday Morning. The former Today star is scheduled to step in on Oct. 9th. She has been a contributor on the program since 2014. Osgood hosted the Emmy-laden program for 22 years after replacing the late Charles Kuralt, who had a 15-year tenure.